"The energies of your psychic centres are quite pure, but there remains a pea-sized impediment of royal pride in your heart. Remove it!" "How can you ever hope to attain realisation when you are so concerned about the purity of your food?" This parting remark cut to the core of Luipa's discriminating and regal pride, so he resolved to live on the banks of the River Ganges, eating only the discarded entrails of fish that the fishermen had gutted. 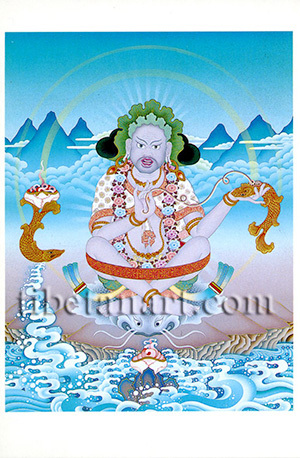 After twelve years of this practice he succeeded in eradicating his royal pride and attained the full realisation of Mahamudra. Luipa is shown sitting cross-legged on a fish-skin with a meditation belt around his knees. He wears a large leaf upon his head as a protection against the sun, and he is adorned with a garland of flowers. He holds a gutted golden fish in his left hand as he pulls the fish's entrails out with his right hand. On his right side another golden fish leaps from the River Ganges bearing an offering of a skull bowl filled with fish entrails upon its tail.